Imagine a politician held a press conference in order to boast about a plan that would take health insurance away from tens of millions of people, while effectively eliminating the federal government except for entitlements and defense spending. You probably can’t, because no politician would ever do that. Except Paul Ryan just did. No, he didn’t put it in quite those terms. Instead, Ryan on Tuesday unveiled the latest version of his proposal for the federal budget, which he calls the “Path to Prosperity.” He vowed that it would reduce deficits, promote economic growth, and strengthen the safety net. The first two claims are dubious, at best. The third is just dishonest—and, if taken literally, morally bankrupt. 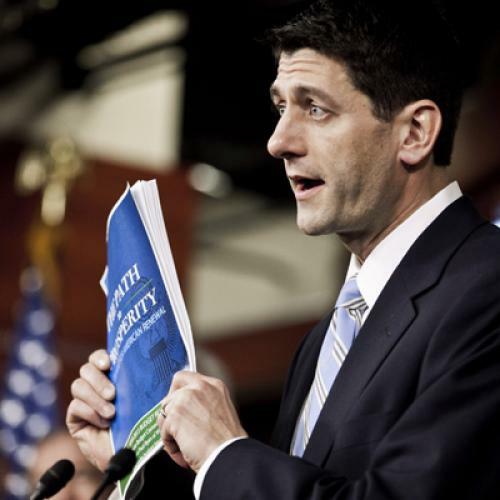 From afar and even up close, the new Ryan budget actually looks a lot like the old Ryan budget. It calls for a reduction in taxes that, if implemented, would likely give a disproportionate share of benefits to the wealthy. It calls for radically reducing discretionary spending, so that it is less than 4 percent of gross domestic product by 2050. And it calls for transforming Medicare into a voucher system. Officially, the end result would be lower deficits, lower even than the deficits that President Obama’s latest budget proposal would produce. And that’s a major selling point for Ryan and the Republicans. But the numbers seem more than a little fanciful. For one thing, Ryan envisions a reduction in non-defense discretionary spending to levels this country hasn’t had since just after World War II. According to the Center on Budget and Policy Priorities, by 2050 “most of the federal government aside from Social Security, health care, and defense would cease to exist.” That’s everything from air traffic control to medical research to food inspections to Pell Grants, by the way. If the Ryan budget somehow became reality then you might have to give up on college and avoid air travel—assuming you survived the food poisoning and killer diseases. He's right. But without those cuts, a big chunk of Ryan's anticipated savings would disappear. The idea that Ryan’s budget would promote a stronger economy (from which, in theory, it would gain even more tax revenue) is just as shaky. If lower taxes always produced higher growth, then the Bush years would have been a lot more prosperous and the Clinton years would have been a lot less. Yes, tax rates have real effects on the economy. But they are complicated and interact with other influences, in ways Ryan and his conservative backers never really acknowledge. But forget about all of that. Let’s focus, instead, on the big target of Ryan’s budget: Health care spending. Last time around, it was Ryan’s Medicare proposal that got the most attention—and, over time, that caused Republicans the most political grief. Instead of preserving the traditional government insurance program, Ryan had proposed that, starting ten years from now, the government would give seniors vouchers with which they could buy private coverage. He promised to keep the old program in place, for seniors who were already on it, and he promised to regulate the private market so that all seniors could still get coverage. But, over time, the value of the voucher would likely have diminished relative to the cost of medical care—producing the huge budget savings Ryan wanted, in part to pay for tax cuts, but also leaving seniors exposed to much larger medical bills. The Congressional Budget Office determined that, by 2022, the typical senior 65-year-old be responsible for two-thirds of his or her medical costs. Ryan has stepped away from that plan, although not by as much as you may have heard. He’s still calling for turning Medicare into a voucher program that would not make the same guarantees of benefits, for example. The difference is that traditional Medicare would remain as an option for seniors, even beyond the next decade. He also envisions the voucher growing a little more rapidly. That, combined with newly revised projects that suggest the cost of health care is growing less rapidly than anticipated, would likely give seniors more protection than the first Ryan budget did. In these respects, it's similar to the bipartisan Medicare framework Ryan put together with Senator Ron Wyden, the Democrat from Oregon. But Ryan's new plan would still leave seniors more vulnerable than they are now—and more vulnerable they'd be even under Obama's latest, most aggressive proposal for cutting Medicare cuts. Chief among the reasons: Even the new Ryan vouchers wouldn't guarantee access to a set of benefits. If costs rise faster than the value of the vouchers, as they very well might, seniors would have to make up the difference themselves. Still, it’s not the Medicare population that takes the biggest hit this time. It's the Medicaid population. For starters—and this was the very first thing Ryan mentioned at his press conference—Ryan would repeal the coverage expansions of the Affordable Care Act. This is old news, I know. But few people seem to appreciate the impact. Take away the Affordable Care Act and you take away insurance from the 30 million people who are supposed to have it come 2014, when the law goes into full effect. About half of them are supposed to get that coverage from Medicaid. Now throw in Ryan’s proposal to convert Medicaid into a block grant, under which the federal government would no longer guarantee insurance coverage for everybody that meets eligibility standards. Instead, the government would simply write checks to the states, for predetermined amounts, and let them figure out how best to spend the money. To generate the savings his budget needs, he’d reduce the value of those grants over time, relative to health care costs and current projections. Altogether, the CBO says, spending on Medicaid, the Children’s Health Insurance Program, and subsidies for private insurance would be nearly 75 percent lower in 2050 than projected under current law. (See figure below, from the CBO report.) Let that sink in for a minute: Ryan wants to reduce the government’s investment in helping people get health insurance by three-quarters. It’s impossible to know exactly how such a cut would play out, at least right now, but when the Kaiser Family Foundation asked the Urban Institute to project the impact of last year’s block grant proposal, it determined that between 14 and 27 million people would lose insurance. Could such a proposal ever get through Congress? Probably not. Those numbers are as fantastical as the one on discretionary spending. But Ryan's willingness to endorse such plans says something. As Ed Kilgore and Ezra Klein observe, the decision to shift the burden of cuts so that the poor feel relatively more of them is no accident. The Republican base these days is disproportionately white and old, which means it’s more willing to tolerate cut to programs that seem mostly to benefit non-white, non-old people. In fact, left-wing polemics about Ryan’s insensitivity to the poor—like the one you are reading, for example—may not bother the base that much. The irony is that many middle class people will gain security from private insurance subsidies from the Affordable Care Act, which Ryan would eliminate. And while Republicans have done their best to caricature Medicaid as just another wasteful program for the lazy poor, the bulk of the program’s spending goes to the disabled and elderly who need extra assistance paying for things like nursing home care. Middle class Americans benefit from those programs, too—if not directly, then indirectly as caregivers and family members. The reality of our fiscal situation hasn't changed: Restoring fiscal balance will require a mix of spending cuts and new revenue. This proposal, like Ryan's last proposal, tries to achieve balance entirely with the former. It's not going to work, nor should it. Note: Having been through this exercise a few times, I've learned that budget proposals frequently look different after a day or two. If that happens, I'll update this item accordingly. In the meantime, if you want more information, I'd advise watching the Center on Budget for updates and reading the Washington Post's Wonkblog for its typically thorough coverage.